Need to change host names so I can run the same test in PROD that I ran in SIT. In order to change a host, in the main menu go to Tools -> HOSTS. This will invoke the Fiddler's "Host Remapping" dialog box. 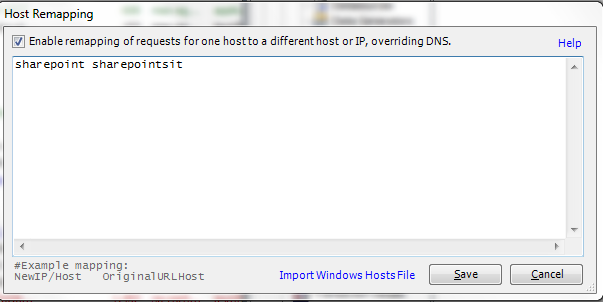 Check the checkbox and in the textbox, type the New Host followed by the Old Host. If you still see sharepointvisit host, we would need to schedule a support session. You're welcome, Tanya and thanks for posting back. Also, host names appear to be case sensitive as far as remapping goes. Good point! Currently StresStimulus uses Fiddler host remapping file which is designed to support case sensitive host names. We cannot change it. However, we can redesign StresStimulus support for host remapping to make it independent from Fiddler. I created an enhancements request here . It will be developed in v 4.0. Thanks for pointing out this issue! As a token of appreciation for helping to make StresStimulus better, we reserved for you a free Weekly pass of StresStimulus Pro with 250 VUs. Just drop me a note at a time when you would want to start using it, and I will send you a serial number.